Snow in the spring is rare, but you can enjoy spring and summer "snowballs" of a different kind if you cultivate a snowball bush. These showy shrubs bloom with large clusters of tiny white flowers, which resemble snowballs. Two shrubs are commonly called "snowball bushes" -- Viburnum opulus "Roseum" and Hydrangea arborescens "Annabelle." Both are hardy in similar U.S. Department of Agriculture plant hardiness zones -- "Roseum" is hardy in USDA zones 3 through 8, and "Annabelle" in zones 3 through 9 -- but they have slightly different care needs and pruning requirements. 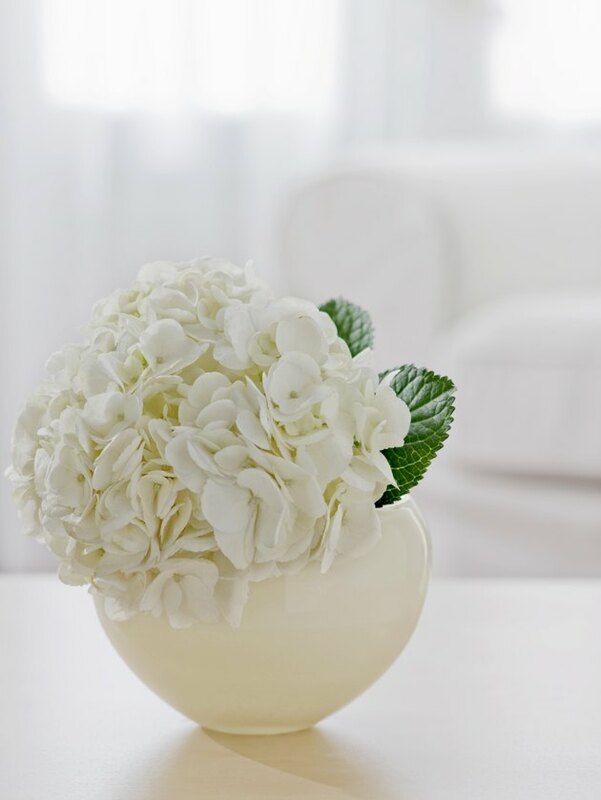 Snowball hydrangeas are popular cut flowers. Wait until the shrub stops blooming and the flowers fade to prune this plant. Viburnum opulus "Roseum" is an early-blooming variety, so pruning should occur in late spring. Brush dirt and debris off of your pruning tool. Submerge the cutting edge in a mixture of 1 part household bleach to 3 parts water. Leave the pruning tool in the solution for a minimum of five minutes. Remove it from the solution and let it dry. This disinfects the tool and prevents fungi and bacteria from spreading from plant to plant. Clip off the spent flower heads and remove the branches back to the desired length to shape the plant. You don't need to make the cuts at any particular point on the branch -- simply cut each branch to the length you prefer. If you wish, you can even remove the branches down to the ground. This shrub tolerates severe pruning, which can rejuvenate the plant and promote bushier growth and more prolific blooming. Wait for late winter if you are going to prune the shrub back to the ground. If you decide to prune only lightly, wait for early spring. "Annabelle" blooms on new wood, so once new growth appears in the spring, the time for pruning is over. Cut all of the stems back to just above the ground if you want big flowers. "Annabelle" will produce larger flowers if all of the stems are cut back to the ground each winter, but the flowers will bloom on weaker stems that may flop over. Cut only some of the stems back to the ground, and leave a few of the stems around the edge of the plant a bit taller -- between 18 and 24 inches. This will create a sturdier frame and help prevent the stems from flopping. Prune weak, damaged or dying stems back to the ground in early spring if you decide to forgo pruning the entire bush.